Samsung’s problems with lawsuits from alleged victims of overheating batteries in the Galaxy Note7 smartphone could get compounded by consumers suing for compensation of carrier charges. The three plaintiffs in a proposed class action lawsuit in a New Jersey federal court are not suing for compensation for personal or property damage from the at times overheating and even exploding Note7 smartphones. 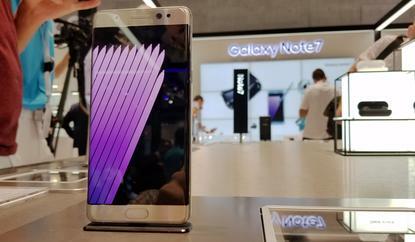 Samsung initially introduced an exchange program for the Note7 on Sept. 2 and eventually withdrew the product on Oct. 10 after problems were found in the replacement phones as well. The company has tried to retain Note7 customers by offering bill credits of up to US$100 to users exchanging their phones with its own smartphones. It also offered users of the phone a refund or an exchange for a Galaxy S7 and S7 edge, besides the option of a replacement with a new Note7. Interestingly the lawsuit does not refer to the bill credits and the option of a refund, which was introduced under a recall announced by the U.S. Consumer Product Safety Commission on Sept. 15. The consumers discontinued using their Note7s only to find that Samsung did not have replacement smartphones available, according to the complaint filed in the U.S. District Court for the District of New Jersey, Newark division by users John Waudby, Robert Spuntak and Mohamad Ibrahim. Samsung instead informed consumers that they would have to wait several days, and even weeks in many cases, before receiving a replacement smartphone, the complaint said. “It was not until September 21 that Samsung announced that it would begin the Note7 exchanges nationwide. And even on that date, only an estimated 500,000 replacement devices had arrived in the United States,” according to the complaint, which claims that as of Sept. 27, about 40 percent of the unsafe Note7s sold in South Korea and the U.S. still had not been replaced with new devices. For about three weeks or more, consumers were left without the safe use of smartphones that they had purchased, during which period they continued to incur monthly device and plan charges associated with their Note7s, the complainants state in the filing. By Oct. 10, Samsung announced that it was discontinuing the Galaxy Note7 and a few days later announced an expanded recall of all Note7 phones. The plaintiffs are seeking to represent a nationwide class of persons and entities in the U.S. who purchased or leased a Samsung Galaxy Note7, or in the alternative separate state sub-classes of users in Nevada, Pennsylvania and California, the three states of which the plaintiffs are residents.